Prop 65, aka the Safe Drinking Water and Toxic Enforcement Act, requires CA to publish a list of chemicals known to cause cancer or reproductive toxicity, and for businesses with 10 or more employees to provide warnings when they knowingly and intentionally cause significant exposures to listed chemicals. 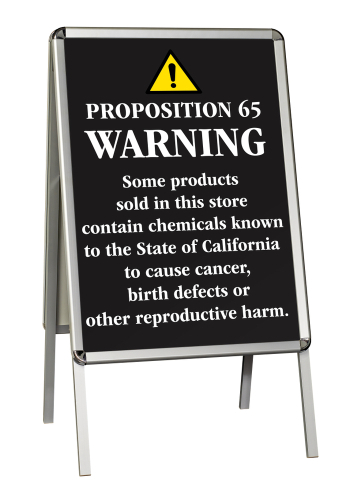 NOTE: Prop 65 does not ban or restrict the sale of chemicals on the list. NOTE: The new OEHHA regulations adopted in August 2016 took full effect in August 2018. Previously, most Prop 65 warnings (safe harbor warnings) simply stated that a chemical was present that caused cancer or reproductive harm, but they did not identify the chemical or provide specific information about how a person may be exposed or ways to reduce or eliminate exposure to said chemical(s). WHAT CIRCUMSTANCES REQUIRE WARNINGS IN LANGUAGES OTHER THAN ENGLISH? Manufacturers have the primary responsibility for providing Prop 65 warnings. Manufacturers can choose whether to put warning labels on their products or to provide notices to their distributors, importers or retail outlets that a product may cause an exposure to a listed chemical that requires a warning provide warning signs or other warning materials. Manufacturers can also enter written agreements with retailers to modify this allocation of responsibility as long as the consumer receives a clear and reasonable warning before they are exposed to a Prop 65 chemical. Retailers must confirm they received the notice and must use the warning signs or other materials provided by the manufacturer. ⟵How To Effectively Protect Your Intellectual Property: Trademark, Patent, or Copyright?